Operation Oboe Six was the codename for the campaign by Australian forces to retake Brunei and Labuan island from Japanese forces between 10 June 1945 and the end of World War II. Operations commenced with amphibious landings by the Australian 9th Division at "Brown Beach", near the town of Victoria, on Labuan island; "White Beach" at the south-east tip of Muara island and at "Green Beach", north of Brooketon, Brunei. The Australians faced an under-strength Japanese unit, the 56th Independent Mixed Brigade (Thirty-Seventh Army). The 371st Independent Infantry Battalion defended Labuan, while the 366th Independent Infantry Battalion and the 367th Independent Infantry Battalion were in Brunei. A map showing the movements of the main Australian infantry units in North Borneo. The objectives of Oboe Six were the securing of the Brunei Bay area so that it could be used as an Allied naval base, and capturing oilfields and rubber plantations/factories. One of the greatest difficulties faced by the Australians was obtaining the necessary shipping, and the landings had to be delayed by a few days because of this. Naval bombardments and air attacks preceded the Australian troops. The landings at White and Green Beaches were unopposed and most of the Japanese forces in the area withdrew before the Australians encountered them. 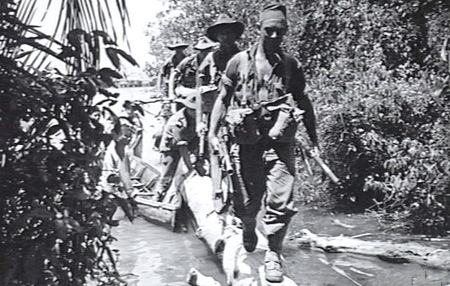 However, on Labuan, the Japanese made a stand in a swampy area of jungle known to the Australians as "The Pocket". Although they were outnumbered in the area by a factor of roughly 10:1, the Japanese waged a dogged resistance campaign. The Japanese 371st Battalion counter-attacked on June 20, after which organised resistance ceased. Nevertheless, fighting continued until the end of the war, by which time most of the original defenders, and more than 100 Australians had been killed.